Read the story of Deborah as an Israelite judge in Judges chapters 4 and 5. As a Prophetess, Deborah heard messages from God and transmitted them to the Israelites. Judges settled difficult (mostly legal) cases from the people, led the Israelites in war against their enemies, and attempted to keep the Israelites from turning to idolatry. Deborah was from the tribe of Ephraim. She held court in a fixed location rather than traveling a circuit. Deborah’s court was located under a palm tree in the hill country between Ramah and Bethel. The site was called the Palm of Deborah. At the time that Deborah was judging Israel, the Israelites had been oppressed for 20 years by Jabin, king of Hazor. Jabin ruled a large, well fortified city in northern Canaan. It is probable that he also led a confederation of Canaan city states. King Jabin had a disciplined, well-armed army under the command of Sisera. This Canaanite army had 900 iron chariots. To put this number into perspective, Egyptian Pharaoh Thutmose had 924 chariots in the entire Egyptian army. Israelites living in the area were demoralized. It was not safe for them to travel main roads. Instead they took winding paths to avoid enemy troops and marauders. Village life ceased; villagers fled to walled towns for protection. The Israelites had few weapons to defend themselves. God instructed Deborah that Jabin’s yoke of tyranny was to be thrown off under the military leadership of Barak, a man from the tribe of Naphtali. God specified the approach to use to defeat the superior army – “I will lure Sisera … with his chariots and his troops to the Kishon River and give them into your hands.” When Deborah delivered God’s message to Barak, Barak did not trust God’s deliverance of the Canaanite army into his hands. Possibly Barak was thinking of the military advantage of the 900 iron horse-drawn chariots over the poorly armed Israelite men. Barak told Deborah that he would fight the battle, but only if Deborah would go with him. Deborah agreed to go with Barak; but apprised Barak that because of his lack of trust, honor for Sisera’s death would go to a woman. Barak gathered his troops on Mount Tabor, a hill in the Jazreel Valley about 10 miles SW of the Sea of Galilee. The Kishon River passed through the Jazreel Valley. The area near the river is flat and normally dry; however, if the river floods, the area becomes muddy and virtually impassable. God lured Sisera to the Jazreel Valley by allowing Sisera to learn that Barak’s army was camped on Mount Tabor. Probably, Sisera approached this battle with confidence. The flat Jazreel Valley was an ideal place to maximize the advantage of his chariots against the Israelite foot soldiers; however, Sisera did not count on God’s intervention. God caused a heavy down pour of rain. The result was the Kishon River flooding into the Jazreel Valley making it a muddy quagmire. Sisera’s chariots could not maneuver in the mud and all Sisera’s troops were killed by the Israelites. Sisera fled on foot and arrived at the tent of Jael, a Kenite woman. After Sisera went to sleep in her tent, Jael killed Sisera with a peg driven through his temple. When Barak came to Jael’s tent in pursuit of Sisera, Jael showed Barak the dead body of Sisera; thus, a woman, not Barak, was credited with killing Sisera. After the destruction of Jabin’s army and Sisera’s death, the Israelites grew stronger and eventually destroyed King Jabin. This military action gave the Israelites, who mainly lived in the hills, access to the fertile Jazreel Valley. The Bible records that after these events Israel had peace for 40 years. The Bible does not describe what Deborah did after the military victory. Likely Deborah went back to the palm tree and continued to act as a Judge. Old Testament Chronology records that Deborah was a Judge for 40 years (NIV Study Bible, 2002). The date palm tree, Phoenix dactylifera, is native to the Middle East and Southwest Asia. 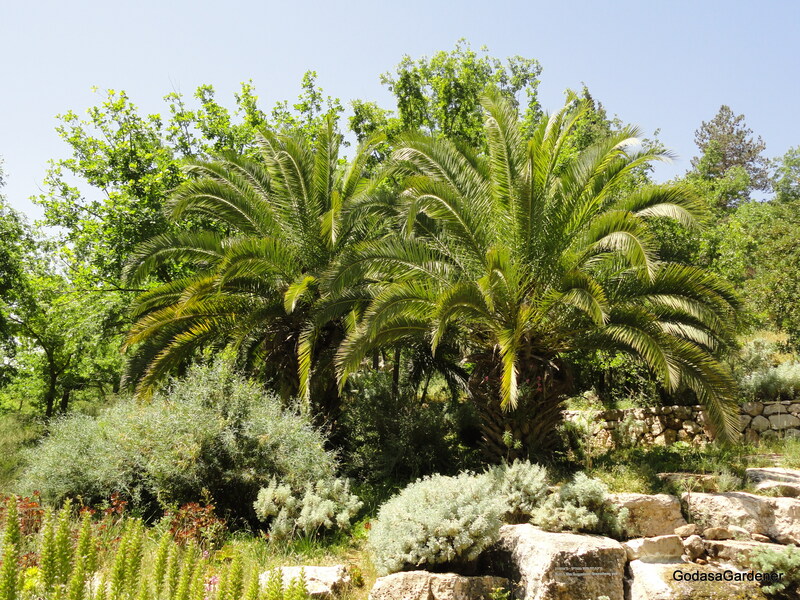 In Israel the palm tree is widely distributed. In the Hebrew language tōmer means palm trunk or tree; tōmer is derived from a root word meaning “to be erect.” Usually, date palms are 30 – 65 feet tall. In contrast to many other trees, P. dactylifera has only a single point of growth – the terminal bud. If the terminal bud is cut away the tree will die. Palm tree leaves ( called fronds and branches) grow from the tree top (crown) in an alternate pattern such that palm trees resemble an umbrella at the top of the long, slender handle. Palm branches are used in Easter processions in Christian churches. Each year palm trees grow a new group of leaves. The date palm is an evergreen. When the Promised Land was described to the Children of Israel, it was called a land of milk and honey. Contrary to common believe, in these verses honey was not produced by bees. Rather, honey was syrup preserved from dates from the P. dactylifera.. The Phoenix dactylifera has much symbolism attached to it. The palm tree and/or its branches represented peace, plenty and fruitfulness, grace and elegance, and majesty and military triumph. Juxtaposition to these perspectives is how the palm tree fits into the story of Deborah. In Deborah’s situation, the palm tree signified justice. Deborah held court under the palm tree and distributed justice. Deborah responded to God’s call and initiated a battle that obtained justice for the Israelites against their Canaanite oppressors. Deborah dispensed God’s justice when she told Barak that a woman (Jael) would be credited with killing Sisera because Barak refused to go to war without Deborah’s presence. God expected the Israelites to exhibit justice. Through God’s laws they were instructed not to pervert justice, show partiality to the poor, or favoritism to the great (Exodus 23:6; Leviticus 19:15; Deuteronomy 16:19). They were told the man who withholds justice from the alien, the fatherless or the widow is cursed (Deuteronomy 27:19). The prophets exhorted the Israelites to “learn to do right! Seek justice, encourage the oppressed” (Isaiah 1:17). The Israelites even had proverbs that addressed justice, e.g., “when justice is done, it brings joy to the righteous but terror to evildoers” (Proverbs 21:15). Thought: How can I show justice in my various roles and duties today – just today – no other day? Do I have to change some of my behaviors to act justly today, just this one day? Hmmm – do I really want to change my behaviors to act justly even if it is only for one day? Copyright May 16, 2011, Carolyn A. Roth; all rights reserved.